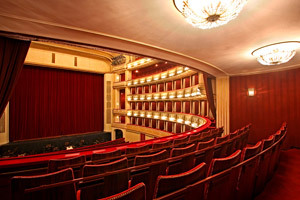 MacMillan, McGregor, Ashton is the Vienna State Opera’s celebration of three of ballet’s most distinguished and exciting talents. In an ingenious piece of programming, the Wiener Staatsballett will perform a trio of highly contrasting works that nonetheless have a common strand running through them all: dance’s fascination for the potential of the human body. Kenneth MacMillan’s Concerto received its premiere at the Deutsche Oper in Berlin on 30 November 1966. Set to Dmitri Shostakovich’s Second Piano Concerto in F major, Concerto has no plot; the purpose of MacMillan’s choreography is quite simply to interpret the music. Instead of searching for meaning, Concerto offers its audience the opportunity to enjoy two art forms meld seamlessly together. Wayne McGregor created Eden | Eden, first seen on 7 April 2005, for the Stuttgart Ballet. Its music and libretto come from Three Tales, an opera by Steve Reich. McGregor ponders cloning from an existential rather than an ethical point of view. Can a copy of ourselves be the same person? And what are the consequences for the human soul? Frederick Ashton devised Marguerite and Armand, the final piece in this presentation, specifically for Rudolf Nureyev and Margot Fonteyn, who performed the work for the first time at the Royal Opera House in London’s Covent Garden on 12 March 1963. The narrative of Marguerite and Armand is drawn from the novel La Dame aux Camélias, by Alexandre Dumas, fils. Ashton chose to choreograph Marguerite and Armand to music by Franz Liszt, in part because the composer, like the author, had an affair with the real-life subject of the book, Marie Duplessis, the inspiration for its protagonist, Marguerite Gautier. Like all the arts, ballet may be a fiction. But, as the works of these great British exponents of the genre suggest, its primary concern is a search for the truth.